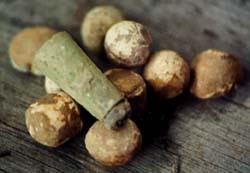 Musketballs were the common find of the day, but a first model Brown Bess ramrod tip, engraved with "No. 50" on its forward surface, was an added bonus. Had I known what the first day of the hunt was going to be like, and the trials we would have to face during the course of those long hours, I think this relic hunter would have stayed in his tent and begun the hunt on the second day! As we stood on the valley floor looking to the lofty heights above us, I knew we were in for a relic hunt which would become more like a test of endurance during the coming hours. The rocky face of the mountain, with its commanding views, would have offered those long-gone Colonials a perfect vantage point from which to view the surrounding terrain and lake approaches; and we knew that if they had been stationed there, the evidence would be found in the ground. Once we had broken through the wood line, we picked up a heavily traveled deer trail and began the ascent. The humid air was filled with legions of mosquitoes, and the temperature rapidly began to rise into the mid-90s. We hoped the forecast of possible late afternoon thunderstorms would be incorrect. 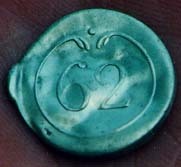 This bone-backed, silver officer's button from the British 62nd Regiment was one of the best finds on the second day of the hunt. Reaching the first overlook, we broke out our detectors and began a search for previous inhabitants. Finding only an old axe head, we moved on to the next rocky overlook above us. And so the day went. Like mountain goats leaping from one rocky precipice to the next, we moved to succeeding overlooks until we reached the summit, with empty collecting bags continually reminding us of our lack of success. 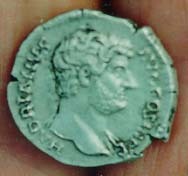 Did some Roman legionnaire drop this silver coin as they fought to expand the territory and influence of the Roman Empire? In excellent condition, it's probably one of the most beautiful coins I have ever seen! Always the eternal optimists, we knew that our luck would change on the eastern face of the mountain which overlooked the fort, and it did... it got worse! Having come up empty on two of the eastern overlooks, we began to hear a distant rumbling. It was not the roar of cannon fire which would have echoed down the valley in centuries past, but the dismal weather forecast coming true. Soaked from the skin out by perspiration, our water supply almost gone, and facing a thunderstorm while standing on the top of a mountain, we knew our luck would be better on the second day of the hunt... simply because it surely couldn't get any worse. Once again, however, we were wrong! With a good portion of the ascent behind us, we stopped on a western overlook to search for evidence of former occupation. Had we known what the next six hours would bring, we probably would have headed back down the mountain... on the correct side. As we began our descent, the skies opened up in a torrential deluge which rivaled Biblical accounts. The lichen- and moss-covered rocks became as slick as grease, and the clay-filled soil little better. We began following a once-dry streambed which slowly began to babble with the runoff, and in such a slipping, sliding, and staggering fashion we progressed toward the valley floor- drenched to the bone. The first sound of civilization to meet our ears was that of tractor trailers rushing by on the unseen roadway below. We knew then that something was wrong, as The Grey Lady was parked on a residential street on which heavy trucks were forbidden. Ooops! Approaching an area of the woods where the trees had recently been cleared, we were given a view of the lake; and instead of the narrow stretch of water we expected to see, we discovered two things... a broad expanse of water and the fact that what we were looking at was the wrong lake! OOPS! again. Paul described the sites he had hunted as being untouched, with coins dating from the Roman occupation scattered throughout the fields. I looked at Gene, Gene looked at me, and if ever quizzical looks were passed between two men, it was at that instant when we finally realized we had followed the wrong streambed, down the wrong side of the mountain, to the shores of the wrong lake! As we broke out onto the roadway, we were faced with the bitter choice of either turning around and climbing back up the mountain and descending on the correct side, or hiking another six miles around the mountain to where the truck was parked. Looking back at that lofty summit from which we had just descended, and with language seldom used by the clergy, we decided to stick to the road! Chafed and blistered, soaked and staggering, muddied and bedraggled- feeling like soldiers in Napoleon's army on their retreat from brutal ordeals in Russia- we limped through the town to the hummed tune of the "Gary Owen," a true spectacle for all the local residents who had sought the shaded porches of their homes. I am sure more than one call to the police station reported a pair of vagrants who had invaded their sleepy little village! There are those rare days when detecting a manicured park and a school playground seems so awfully inviting... but a hot shower and a good night's sleep usually go a long way toward dismissing such thoughts! A competitor in the Black Diamond hunt, Paul had recently returned from a trip to eastern Europe, where he was able to recover numerous coins from the 1st century! With fresh battery packs we headed out on the second day of hunting, and within ten minutes of hitting the field Gene was able to recover a bone-backed, silver officer's button from the British 62nd Regiment which arrived in North America in May 1776 and served with Burgoyne's army in the Saratoga campaign. It's amazing sometimes just how quickly your relic hunting luck can make a dramatic turnaround! We continued searching for the major portion of the day, pulling musketball after musketball from the now-soft soil. In addition to the dropped and fired balls, we were able to recover a couple of complete Colonial buckles and a first model Brown Bess ramrod tip with "No. 50" engraved on its face. What little time we had remaining during that weekend was spent in tracking down some new potential sites and establishing permission to search them in the coming months. It's always nice to know that you have someplace you are allowed to search, in advance, after making a long trip... getting the "politics" of relic hunting behind you, so you can begin getting your hands muddy from the start! In August, when crops are thriving and lawns are too delicate to touch, we always shift our relic hunting gears for awhile and head out to the Black Diamond competition hunts outside Wilkes-Barre, Pennsylvania. It's a time of meeting old friends and making new ones... a time of fast hunting, great prizes, and an avalanche of treasure hunting stories. Many of the competitors bring along some of the best finds they have made during the course of the year, and some of those recoveries are enough to leave your eyes gaping and your jaw slack. 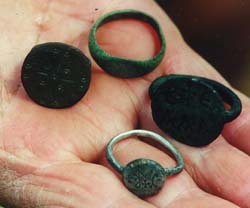 In addition to coins and other recovered artifacts, these Roman rings of bronze and silver were recovered during Paul's eastern European relic hunt. It's strange how the week before we were thrilled with recoveries from the 18th century, and suddenly we were viewing relics nearly 2,000 years older! I've talked with Paul at many hunts and have always been thrilled by the retelling of treasure hunting adventures he has had outside the United States. As we walked together, returning from one of the hunt fields, Paul began telling me about his latest hunt in Eastern Europe... stories about early bronze pieces and Roman silver... of untouched relic sites and ancient jewelry. I hazarded a question. "You didn't happen to bring any recoveries along, did you?" "Sure did," Paul replied, and I could tell from the gleam in his eye that I was about to witness some extraordinary finds. Initially, I was astounded not only by the age of the coins Paul passed to me, but by their size. 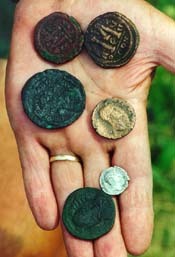 Many of the bronze coins, minted in the 1st century, were as big as silver dollars, if not larger. For the most part, the bronzes were crudely done and functional, but a small silver coin bearing the likeness of a Roman emperor was beautiful in its design and artistry. The coins were followed by several ancient rings Paul had also recovered on his European hunt, and I was amazed when I was shown that one of the rings was adjustable... a kind of Roman era "one-size-fits-all" model! 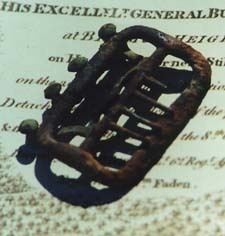 This complete Colonial buckle was recovered on the side of a stream bank. The stream, the only water source in the immediate area, was sure to draw thirsty troops in centuries past... just as it drew relic hunters today! It must have been at the point when I was holding all these pieces of ancient history in my hands that I realized just how relative age is in regard to the relics we recover. In the "New World" we search for the earliest beginnings of that Colonial wilderness empire, and if we can recover an artifact or a coin dating from the 1600s or 1700s, it's the frosting on our relic hunting cake. Yet for those who search the "Old World," such recoveries are easily taken for granted, given the age of the sites they hunt and the number of varied people who once occupied them. As I held those Roman coins and rings in the palm of my hand, it was impossible to push away thoughts of ancient legions manning distant outposts so far from Rome... and I knew they thought of distant loved ones and families they had left behind, so much like those British foot soldiers who traveled across the Atlantic to fight and attempt to maintain the extremities of their empire. Men had not changed- soldiers had not changed- only the time. The experiences, thoughts, longings, sorrows, and joys, they held in common. The age of relics is indeed relative to where they are found, and the relic hunter can appreciate them all, whether they're found on the banks of the Black Sea or along the shores of the Hudson River. Each, in its own context, reflects the shared human experience we all call history! 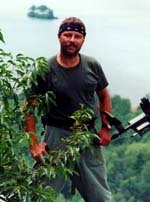 Author's Note: As I left Paul with his incredible finds and walked, in a gingerly fashion, still enduring the effects from the previous week's case of terminal chafing, I thought about telling Paul about my mountain climbing experiences. No, I decided, one "great" story a weekend is enough, and Paul had that covered by a good country mile!